The Rolex Oyster Perpetual Lady's Day-date Cheap Copy Watches are strikingly in accordance with Rolex classic style, studded with sparkling magnificent gems, vivid charm without fear the test of time. The unique gold crystal dial interpretates omega replica exquisite women's watches which are completely exquisitely dainty and ravishingly beautiful. The material of the dial is made of the natural crystal charm gold. When replica watches uk dial meets with the light, this honorable material will display the dreamy charm, like flowery light, dazzling bright, unfolding in all watches. Each gold rolex replica crystal dial embraced each other becoming art treasures. In its original the dial, there are studded with 10 teeth dazzling diamonds, inlaid with replica breitling watches 46 pieces of precious diamonds shining the outer ring, showing the noble and elegant temperament. I first started collecting novels about King Arthur when my parents bought me one my first comics for the long drive to our holiday destination, when I was about seven years old. Although that sparked a very different collection at the time (comics, of which there are about 2000 loitering about here now), my Arthurian curiosity only changed to a historical 'obsession' when I became familiar with the children's/young adult genre. More specific, the novels by Rosemary Sutcliff that I found in our local library. My first experience with these fantastic books was 'Eagle of the Ninth', and other books by Sutcliff soon followed. What then started the Arthurian collection was 'The Lantern Bearers', featuring the young Arthur. Though I was about ten at the time, it made a big impression and that particular volume is still very dear to me. The sequel though ('Sword at Sunset', of which I 'discovered' a translation on my parents' bookshelves) I still consider the very best Arthurian novel ever. Enjoy your browsing through this collection! 09/10/2008: An interview with John Matthews about his book 'Arthur of Albion' John Matthews is the author of dozens of books about Arthur and his Knights, the Grail and Merlin. 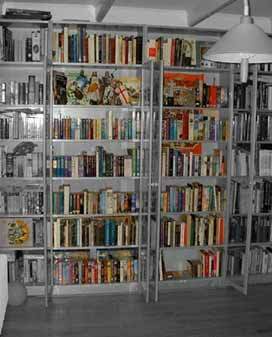 The collection consists of all kinds of of Arthurian books. Novels mostly, of course, but also historical and fantasy versions of the legend, though there are some very good horror, espionage, detective or even SF variants as well. I think that every possible derivate of the legend deserves a place in this collection, but I do tend to be somewhat more strict when it comes to Classical literature. These are indeed mostly variants of the same theme (the 'Round Table', 'Merlin and the Dragons' or 'Young Arthur'). The (Pseudo-) scientific part of the collection contains all kinds of books, from the really good scientific research to the sheer lunacy (a.k.a. 'bestseller') that's on the market nowadays. I am also a bit strict when it comes to Children's books. Most are in Dutch I'm afraid. They are variants of the same theme; 'Young Arthur' or 'Young Merlin', 'Tales of the Knights of the Round Table', but with a few exceptions. The comics I enjoy as 'harmless', mostly because they are the part I started off with all those years ago. Most belong to only two series; 'Prince Valiant' and 'De Rode Ridder' (Red Knight). Third largest is the reality series by Cothias/Rouge. All comics are in Dutch, with a few in French. While the music is mostly of the instrumental kind (epecially that by Medwyn Goodall), the movies vary from classic action movies to the absurd (Monty Python), though most of them are animated. Starting with calendars, games (card, CD-Rom, role-playing or tarot), I also have a few swords!